Dir: Alinah Azadeh, edited by Lisa Pfeiffer. A multi-layered lyrical journey from West to East. This debut film used the artists own drawings, paintings and found objects to explore the Iranian side of her cultural identity. She experimented with a wide range of animation techniques and discovered for the first time the magic of working with the moving image. The film won Special Mention for Innovative use of animation at the Viva 8! Festival, London 1995 and was screened at The British Short Film Festival 1995, The Cardiff Animation Festival and various other film festivals in the UK. 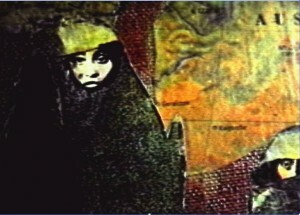 Screened as part of Tabula Rasa, 2002.